Summary of our grinders and saw blade sharpener prices for re-tipping, repairing, & sharpening saw blades. Walter CNC-5D - This grinding machine automatically probes every cutting angle on your table / circular saw blades and programs itself. Then it grinds and sharpens your saw blade to the sharpest edges possible, without human input. This gives a saws new edges with a super long cutting lifespan! 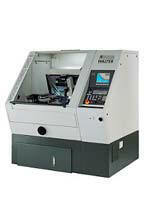 Walter NC3 - This machine is one of the most stable top grinders / sharpeners made for sharpening carbide tipped saw blades. We are able to take advantage of state of the art programs that need only (2 measurements) to be made by the grinder operator. After inputting the measurements made to the (one ten-thousandth) of an inch, your saw blade (steel, carbide) is sharpened to a mirror razor finish. Utma-AP800 - This tool face grinder gives us new features that only a handful of saw shops in the U.S. have - hydraulic blade clamping and wheel liftoff. When we sharpen one of your saw blades, this means it will probably cut better and stay sharper longer than when it was new! 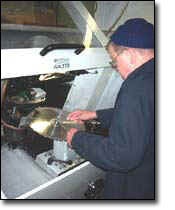 At Dynamic Saw Blade Sharpening, we are excited about being your saw blade sharpener and giving you the best service. 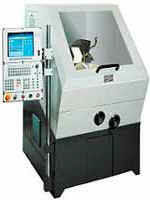 This is part of the "Dynamic Saw Blade Edge". 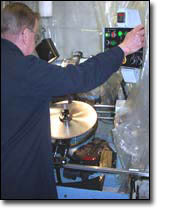 At Dynamic Saw, We Make The Cutting Edge!